Whispers in the Loggia: "I Consecrate Myself... I Sacrifice Myself"
G'mornin, church... and every grace and blessing of this Holy Thursday to one and all -- especially, on this "birthday" of the priesthood, to the selfless, unsung heroes of the trenches. In the Upper Room, on the eve of his Passion, the Lord prayed for his disciples gathered about him. At the same time he looked ahead to the community of disciples of all centuries, “those who believe in me through their word” (Jn 17:20). In his prayer for the disciples of all time, he saw us too, and he prayed for us. Let us listen to what he asks for the Twelve and for us gathered here: “Sanctify them in the truth; your word is truth. As you sent me into the world, so I have sent them into the world. And for their sake I consecrate myself, so that they also may be consecrated in truth” (17:17ff.). The Lord asks for our sanctification, sanctification in truth. And he sends us forth to carry on his own mission. But in this prayer there is one word which draws our attention, and appears difficult to understand. Jesus says: “For their sake I consecrate myself”. What does this mean? Is Jesus not himself “the Holy One of God”, as Peter acknowledged at that decisive moment in Capharnaum (cf. Jn 6:69)? How can he now consecrate – sanctify – himself? To understand this, we need first to clarify what the Bible means by the words “holy” and “consecrate – sanctify”. “Holy” – this word describes above all God’s own nature, his completely unique, divine, way of being, one which is his alone. He alone is the true and authentic Holy One, in the original sense of the word. All other holiness derives from him, is a participation in his way of being. He is purest Light, Truth and untainted Good. To consecrate something or someone means, therefore, to give that thing or person to God as his property, to take it out of the context of what is ours and to insert it in his milieu, so that it no longer belongs to our affairs, but is totally of God. Consecration is thus a taking away from the world and a giving over to the living God. The thing or person no longer belongs to us, or even to itself, but is immersed in God. Such a giving up of something in order to give it over to God, we also call a sacrifice: this thing will no longer be my property, but his property. In the Old Testament, the giving over of a person to God, his “sanctification”, is identified with priestly ordination, and this also defines the essence of the priesthood: it is a transfer of ownership, a being taken out of the world and given to God. We can now see the two directions which belong to the process of sanctification-consecration. It is a departure from the milieux of worldly life – a “being set apart” for God. But for this very reason it is not a segregation. Rather, being given over to God means being charged to represent others. The priest is removed from worldly bonds and given over to God, and precisely in this way, starting with God, he is available for others, for everyone. When Jesus says: “I consecrate myself”, he makes himself both priest and victim. Bultmann was right to translate the phrase: “I consecrate myself” by “I sacrifice myself”. Do we now see what happens when Jesus says: “I consecrate myself for them”? This is the priestly act by which Jesus – the Man Jesus, who is one with the Son of God – gives himself over to the Father for us. It is the expression of the fact that he is both priest and victim. I consecrate myself – I sacrifice myself: this unfathomable word, which gives us a glimpse deep into the heart of Jesus Christ, should be the object of constantly renewed reflection. It contains the whole mystery of our redemption. It also contains the origins of the priesthood in the Church. Only now can we fully understand the prayer which the Lord offered the Father for his disciples – for us. 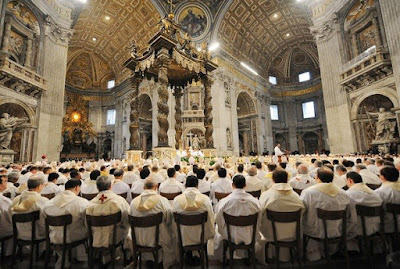 “Sanctify them in the truth”: this is the inclusion of the Apostles in the priesthood of Jesus Christ, the institution of his new priesthood for the community of the faithful of all times. “Sanctify them in truth”: this is the true prayer of consecration for the Apostles. The Lord prays that God himself draw them towards him, into his holiness. He prays that God take them away from themselves to make them his own property, so that, starting from him, they can carry out the priestly ministry for the world. This prayer of Jesus appears twice in slightly different forms. Both times we need to listen very carefully, in order to understand, even dimly the sublime reality that is about to be accomplished. “Sanctify them in the truth”. Jesus adds: “Your word is truth”. The disciples are thus drawn deep within God by being immersed in the word of God. The word of God is, so to speak, the bath which purifies them, the creative power which transforms them into God’s own being. So then, how do things stand in our own lives? Are we truly pervaded by the word of God? Is that word truly the nourishment we live by, even more than bread and the things of this world? Do we really know that word? Do we love it? Are we deeply engaged with this word to the point that it really leaves a mark on our lives and shapes our thinking? Or is it rather the case that our thinking is constantly being shaped by all the things that others say and do? Aren’t prevailing opinions the criterion by which we all too often measure ourselves? Do we not perhaps remain, when all is said and done, mired in the superficiality in which people today are generally caught up? Do we allow ourselves truly to be deeply purified by the word of God? Friedrich Nietzsche scoffed at humility and obedience as the virtues of slaves, a source of repression. He replaced them with pride and man’s absolute freedom. Of course there exist caricatures of a misguided humility and a mistaken submissiveness, which we do not want to imitate. But there also exists a destructive pride and a presumption which tear every community apart and result in violence. Can we learn from Christ the correct humility which corresponds to the truth of our being, and the obedience which submits to truth, to the will of God? “Sanctify them in the truth; your word is truth”: this word of inclusion in the priesthood lights up our lives and calls us to become ever anew disciples of that truth which is revealed in the word of God. I believe that we can advance another step in the interpretation of these words. Did not Christ say of himself: “I am the truth” (cf. Jn 14:6)? Is he not himself the living Word of God, to which every other word refers? Sanctify them in the truth – this means, then, in the deepest sense: make them one with me, Christ. Bind them to me. Draw them into me. Indeed, when all is said and done, there is only one priest of the New Covenant, Jesus Christ himself. Consequently, the priesthood of the disciples can only be a participation in the priesthood of Jesus. Our being priests is simply a new way of being united to Christ. In its substance, it has been bestowed on us for ever in the sacrament. But this new seal imprinted upon our being can become for us a condemnation, if our lives do not develop by entering into the truth of the Sacrament. The promises we renew today state in this regard that our will must be directed along this path: “Domino Iesu arctius coniungi et conformari, vobismetipsis abrenuntiantes”. Being united to Christ calls for renunciation. It means not wanting to impose our own way and our own will, not desiring to become someone else, but abandoning ourselves to him, however and wherever he wants to use us. As Saint Paul said: “It is no longer I who live, but Christ who lives in me” (Gal 2:20). In the words “I do”, spoken at our priestly ordination, we made this fundamental renunciation of our desire to be independent, “self-made”. But day by day this great “yes” has to be lived out in the many little “yeses” and small sacrifices. This “yes” made up of tiny steps which together make up the great “yes”, can be lived out without bitterness and self-pity only if Christ is truly the center of our lives. If we enter into true closeness to him. Then indeed we experience, amid sacrifices which can at first be painful, the growing joy of friendship with him, and all the small and sometimes great signs of his love, which he is constantly showing us. “The one who loses himself, finds himself”. When we dare to lose ourselves for the Lord, we come to experience the truth of these words. To be immersed in the Truth, in Christ – part of this process is prayer, in which we exercise our friendship with him and we come to know him: his way of being, of thinking, of acting. Praying is a journey in personal communion with Christ, setting before him our daily life, our successes and failures, our struggles and our joys – in a word, it is to stand in front of him. But if this is not to become a form of self-contemplation, it is important that we constantly learn to pray by praying with the Church. Celebrating the Eucharist means praying. We celebrate the Eucharist rightly if with our thoughts and our being we enter into the words which the Church sets before us. There we find the prayer of all generations, which accompany us along the way towards the Lord. As priests, in the Eucharistic celebration we are those who by their prayer blaze a trail for the prayer of today’s Christians. If we are inwardly united to the words of prayer, if we let ourselves be guided and transformed by them, then the faithful will also enter into those words. And then all of us will become truly “one body, one spirit” in Christ. To be immersed in God’s truth and thus in his holiness – for us this also means to acknowledge that the truth makes demands, to stand up, in matters great and small, to the lie which in so many different ways is present in the world; accepting the struggles associated with the truth, because its inmost joy is present within us. Nor, when we talk about being sanctified in the truth, should we forget that in Jesus Christ truth and love are one. Being immersed in him means being immersed in his goodness, in true love. True love does not come cheap, it can also prove quite costly. It resists evil in order to bring men true good. If we become one with Christ, we learn to recognize him precisely in the suffering, in the poor, in the little ones of this world; then we become people who serve, who recognize our brothers and sisters in him, and in them, we encounter him. “Sanctify them in truth” – this is the first part of what Jesus says. But then he adds: “I consecrate myself, so that they also may be consecrated in truth” – that is, truly consecrated (Jn 17:19). I think that this second part has a special meaning of its own. In the world’s religions there are many different ritual means of “sanctification”, of the consecration of a human person. Yet all these rites can remain something merely formal. Christ asks for his disciples the true sanctification which transforms their being, their very selves; he asks that it not remain a ritual formality, but that it make them truly the “property” of the God of holiness. We could even say that Christ prayed on behalf of us for that sacrament which touches us in the depths of our being. But he also prayed that this interior transformation might be translated day by day in our lives; that in our everyday routine and our concrete daily lives we might be truly pervaded by the light of God. On the eve of my priestly ordination, fifty-eight years ago, I opened the Sacred Scripture, because I wanted to receive once more a word from the Lord for that day and for my future journey as a priest. My gaze fell on this passage: “Sanctify them in the truth; your word is truth”. Then I realized: the Lord is speaking about me, and he is speaking to me. This very same thing will be accomplished tomorrow in me. When all is said and done, we are not consecrated by rites, even though rites are necessary. The bath in which the Lord immerses us is himself – the Truth in person. Priestly ordination means: being immersed in him, immersed in the Truth. I belong in a new way to him and thus to others, “that his Kingdom may come”. Dear friends, in this hour of the renewal of promises, we want to pray to the Lord to make us men of truth, men of love, men of God. Let us implore him to draw us ever anew into himself, so that we may become truly priests of the New Covenant. Amen.